The new Permanent Representative of The Bahamas to the Organization of American States (OAS), Elliston Rahming, May 6 presented his credentials to the Secretary General of the institution, José Miguel Insulza in Washington, DC. 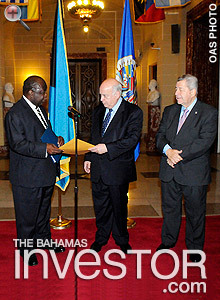 Pictured: (left to right) Elliston Rahming, Permanent Representative of The Bahamas to the OAS; José Miguel Insulza, OAS Secretary General; and Arturo Vallarino, Chair of the OAS Permanent Council and Permanent Representative of Panama to the OAS. 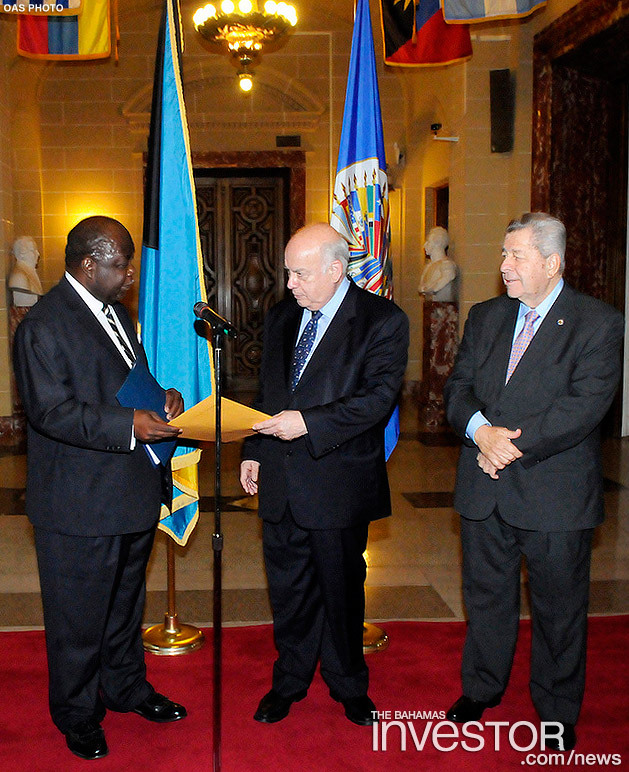 The new Permanent Representative of The Bahamas to the Organization of American States (OAS), Elliston Rahming, May 6 presented his credentials to the Secretary General of the institution, José Miguel Insulza. During the ceremony, held in the Hall of Heroes at the OAS headquarters in Washington, DC, Ambassador Rahming said that, although he is just beginning as his country’s representative to the organization, he is already aware of the benefits brought by the institution. “Last year, in my former position as Superintendent of Her Majesty’s prison, I had the opportunity to participate in the Third Meeting of Authorities Responsible for Penitentiary and Prison policies of the Americas, which gave me first hand knowledge of the work of this organisation and the many hemispheric issues that it addresses,” he said. “When we joined the OAS in 1982, we made a commitment to the democratic ideals, which are the foundation of this most important regional body. I wish to reconfirm my support and the support of the government of The Bahamas to the organization, to the Secretary General, and to the OAS Secretariat, to strengthen The Bahamas’ engagement within the OAS,” he concluded. For his part, Secretary General Insulza welcomed the new Permanent Representative of The Bahamas and highlighted the economic successes of the country, in terms of per capita income and income distribution. “We appreciate the fact that your country, as an independent nation, has demonstrated how it is possible to prosper and develop and face economic and social problems with a very progressive view,” he said. Several representatives of the Member States attended the ceremony for the presentation of credentials, as well as Permanent Observers to the OAS and senior authorities from the General Secretariat of the organisation. Prime Minister Perry Christie brought to a close the debate on whether to introduce a public holiday to mark majority rule in The Bahamas. 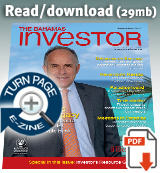 Read his remarks here.